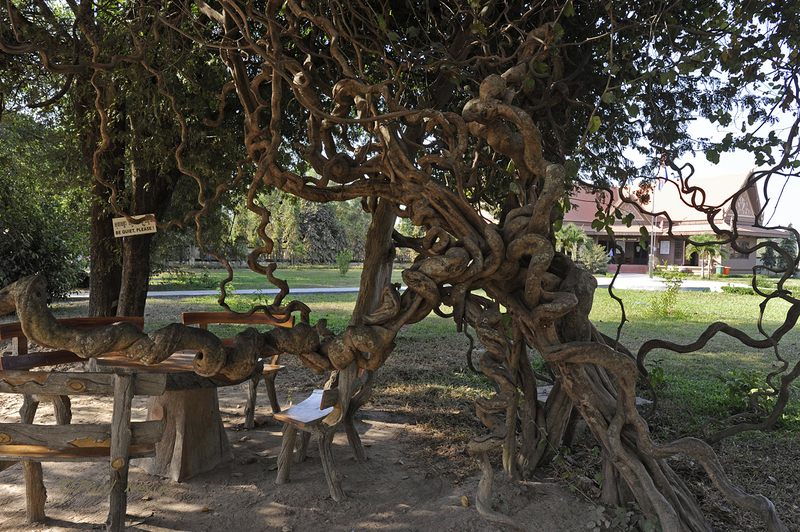 A place in the shade, to contemplate, to prepare for what is before the visitor, and later, a place to remember. I would imagine the significance of the tortured looking vine escapes but a few. 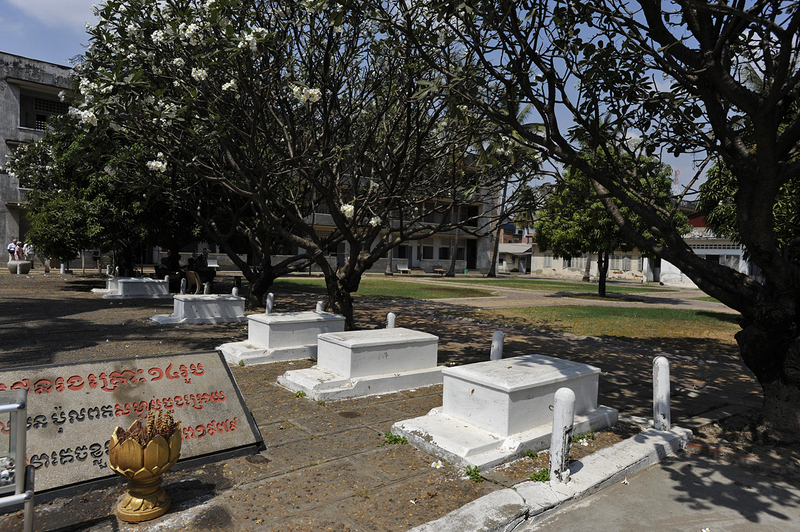 The Memorial Stupa erected at the entrance where victims remains are reverently preserved. A mass grave is at centre of picture. 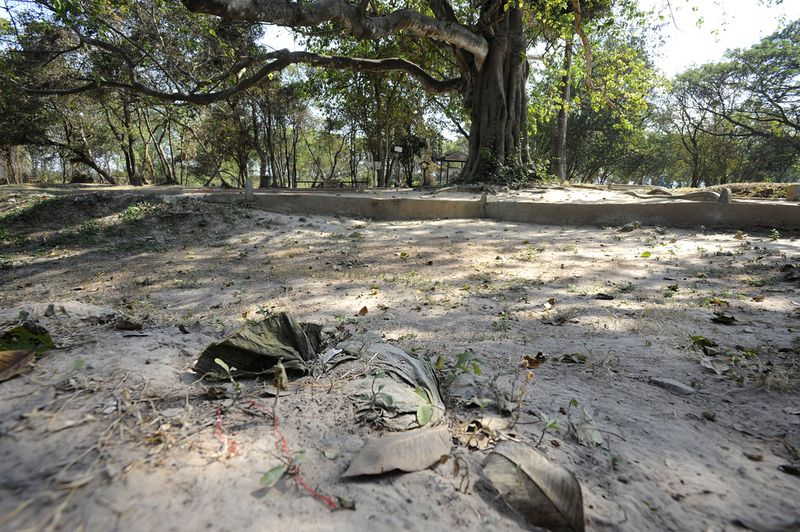 A mass grave for 166 headless victims. 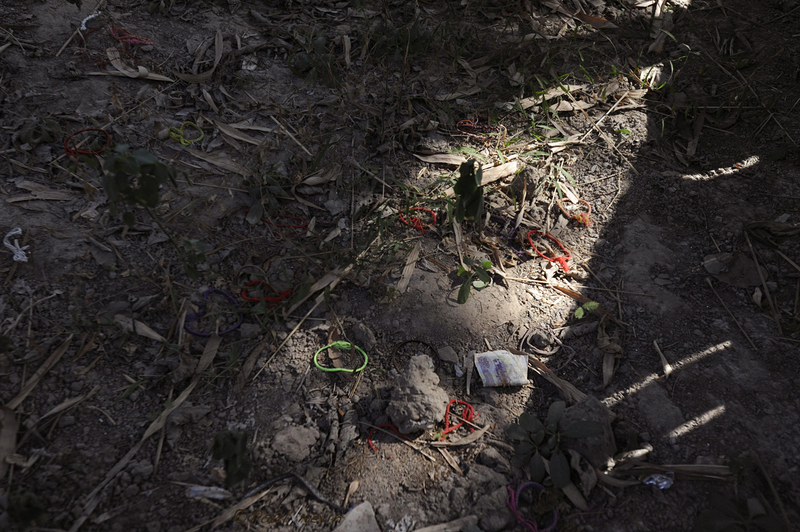 Detail of a mass grave. 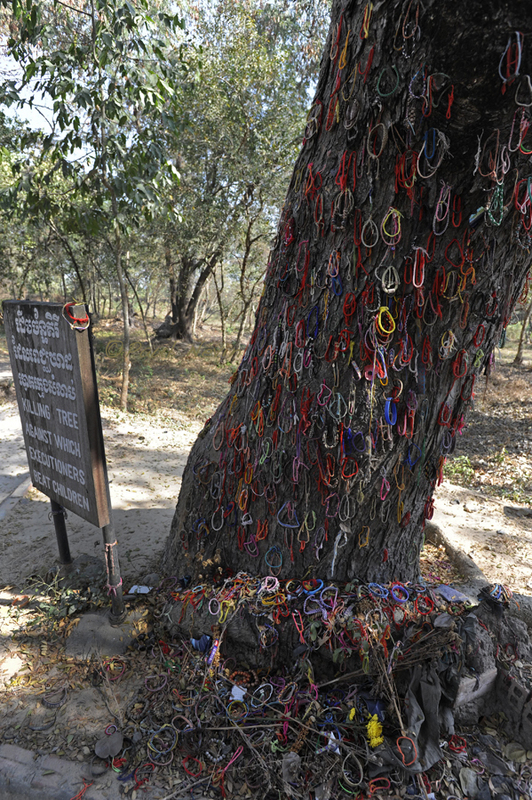 The Killing Tree against which the executioners beat babies and children till they died. 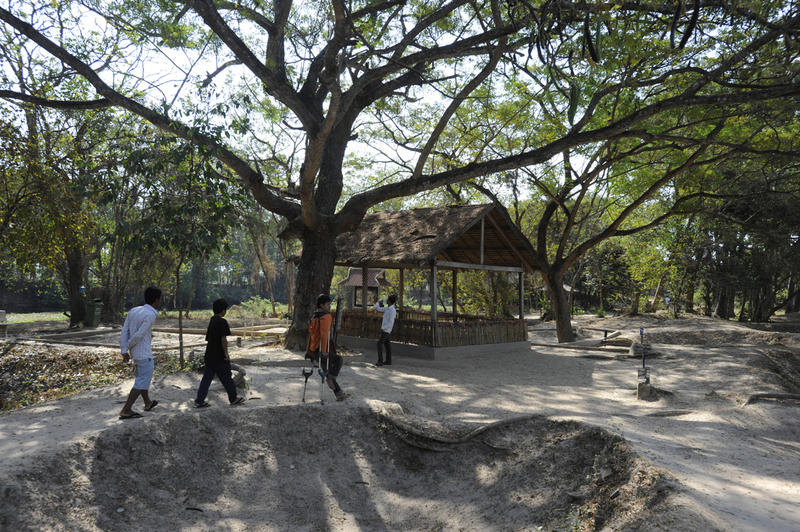 Visitors walking among the pits of mass graves. Detail of victims clothing and bone fragments from a mass grave. 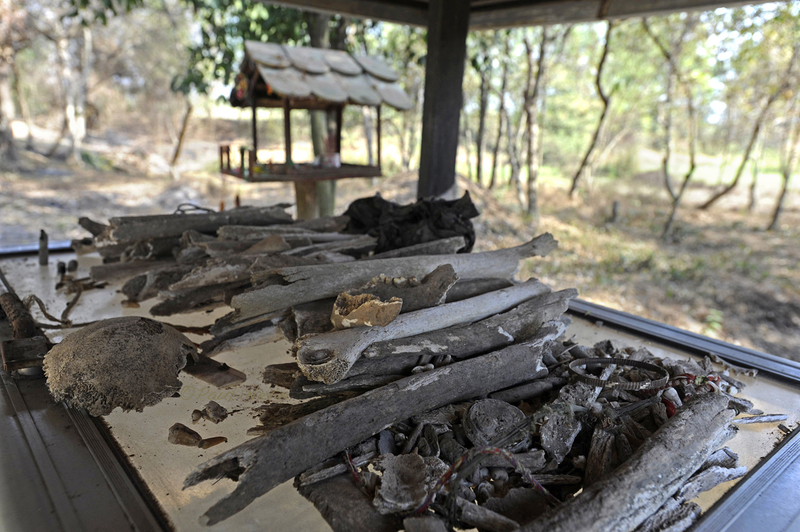 Victims bone fragments collected after being exposed by each passing of the monsoonal rains. 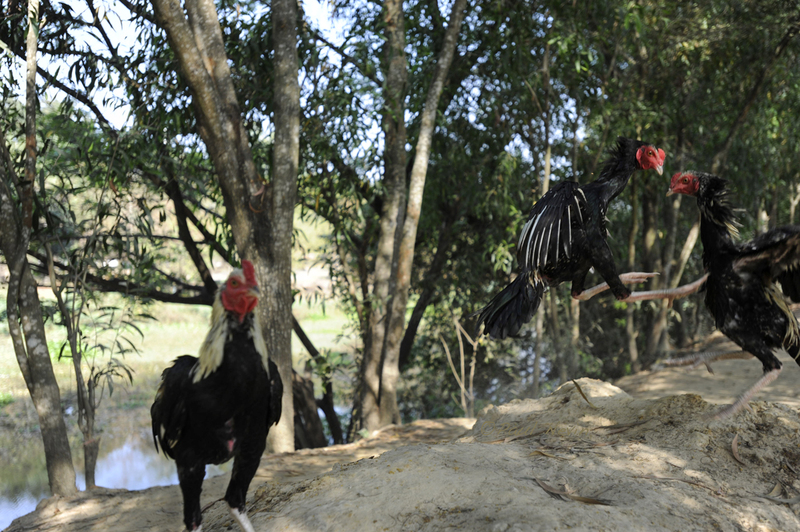 All is now quiet except for the sparring that takes place between these roosters. The pond to the rear is thought to be another mass grave that still awaits excavation. For a small sum of money, considered a donation, it is possible to place flowers or incence in rememberance. 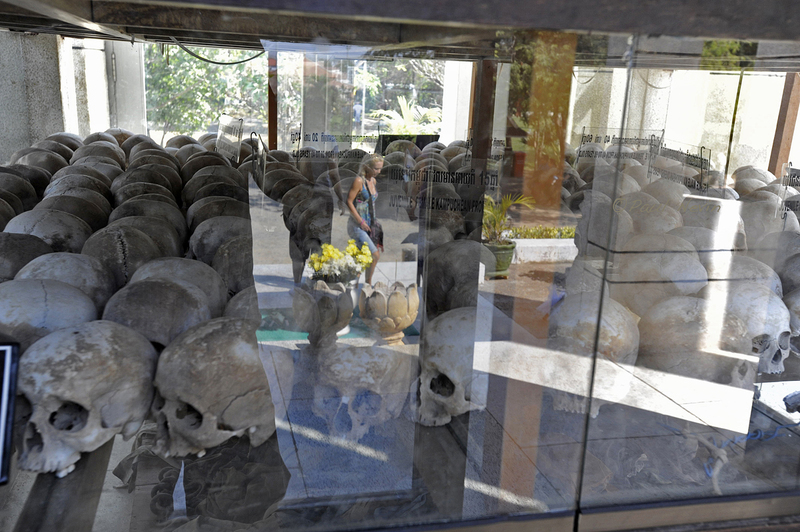 According to age, the sculls of victims are neatly and respectfully displayed in tier’s within the Memorial Stupa. 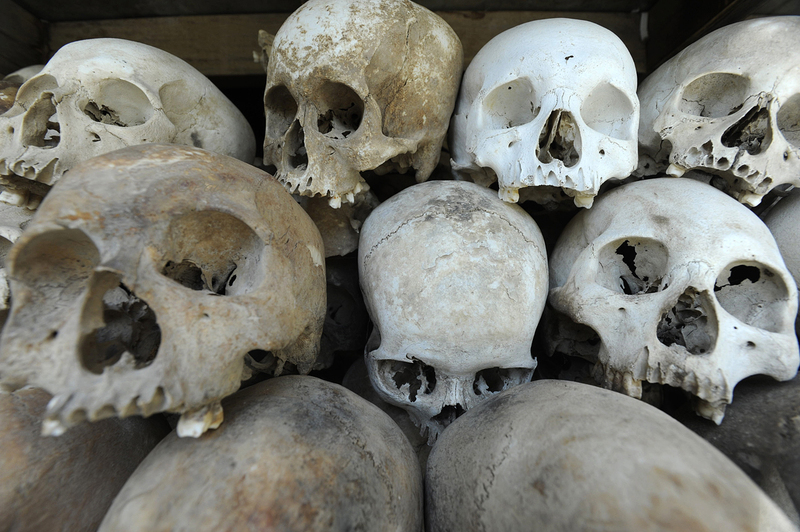 The recovered skulls displayed in the memorial. Face to face with so many of the dead, is sometimes too much for some to bear. 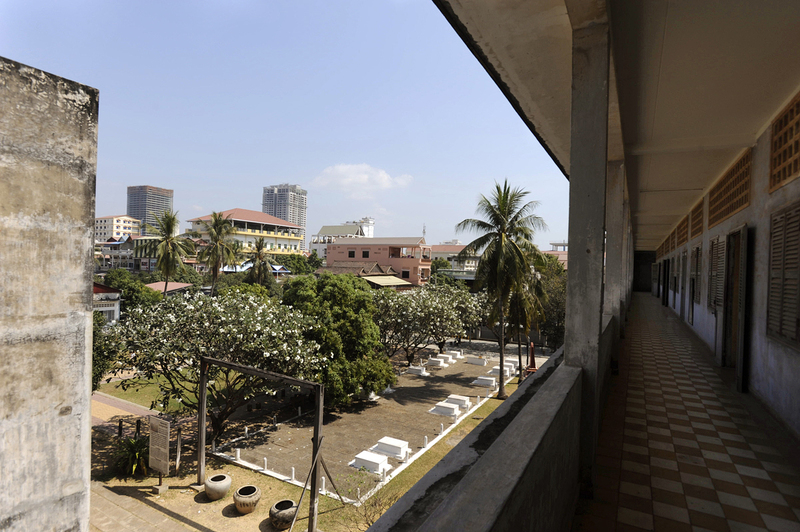 View of classrooms and quadrangle area of Tuol Svay Pray High school in the heart of Phnom Penh. 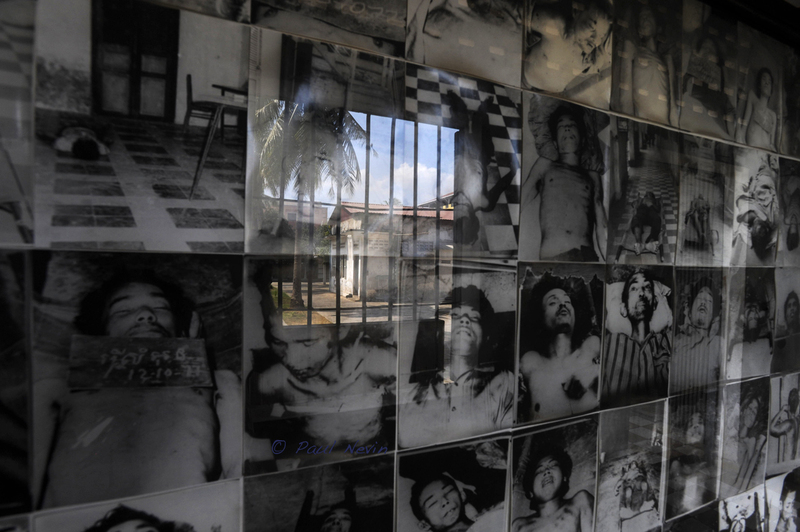 Commandeered and converted by the Khmer Rouge for torture and murder of 20,000 Cambodian people by the Pol Pot regime. 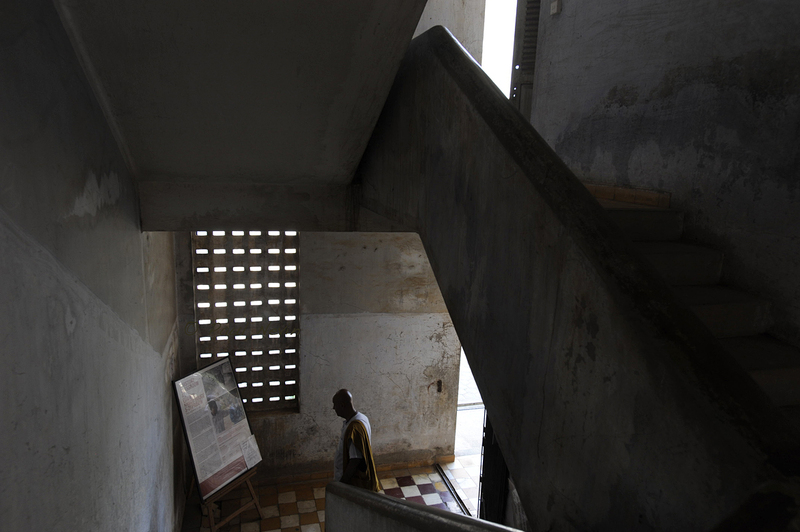 A visitor surveys details of of what the particular building was used for, including what type of victims were tortured there. 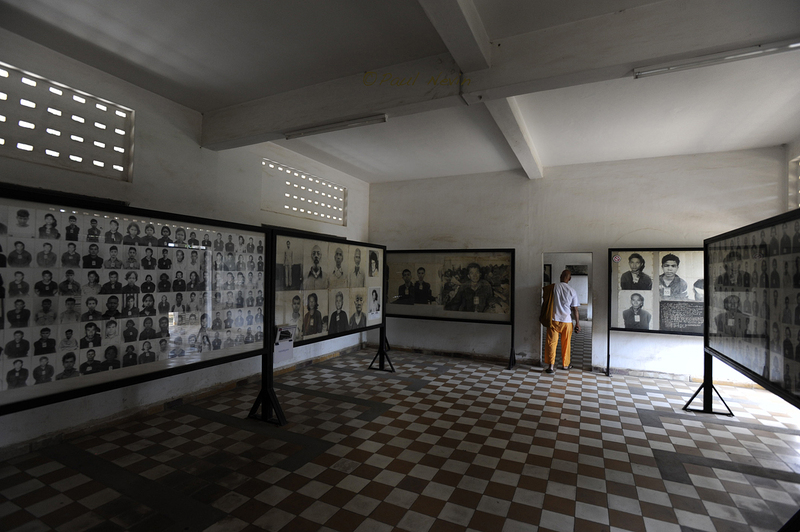 A visitor moves from room to room observing the displays of countless photos of men, women, and children tortured and murdered at S-21 prison. The school headmasters office was used as the prison administrators office. 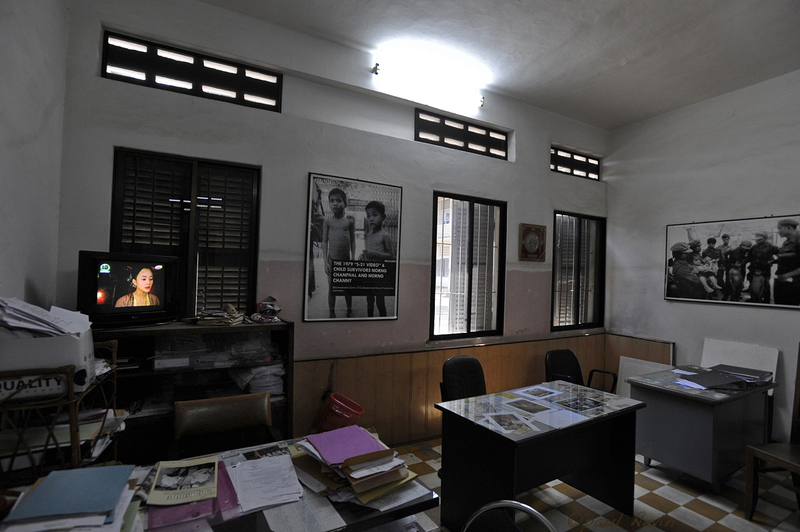 Nowadays the museum administrators office. 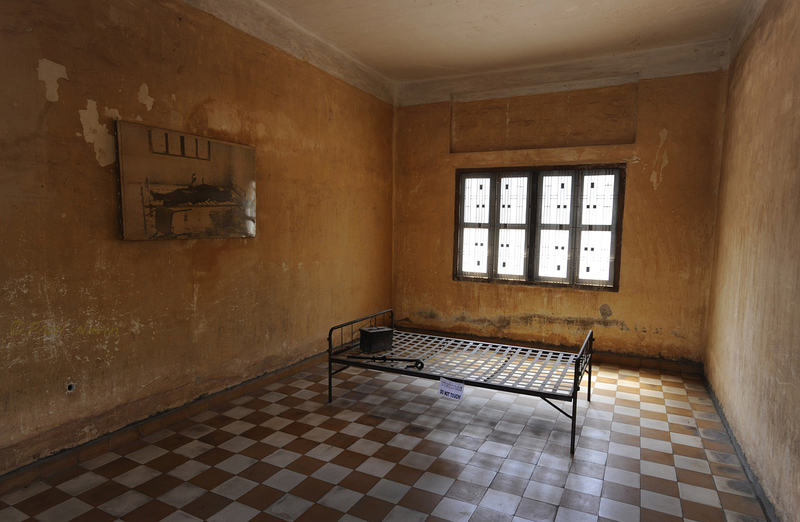 One of several school classrooms converted for torture. 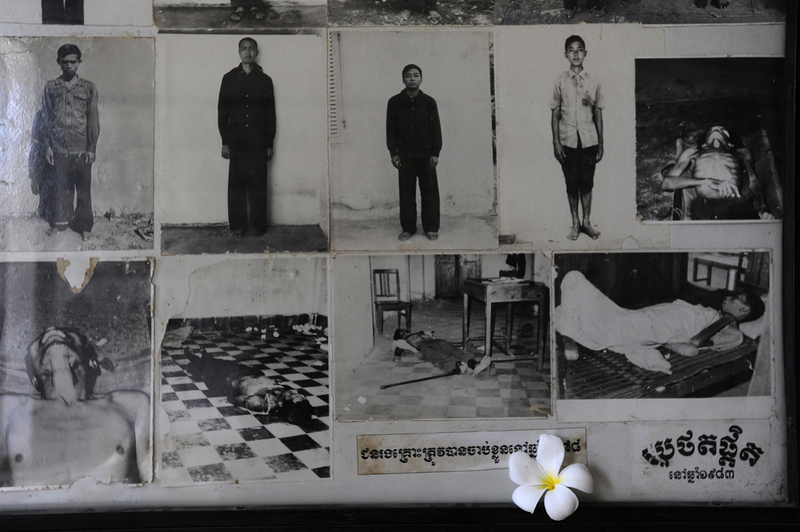 The body of one of the last 14 victims found tortured and murdered by the Khmer Rouge before they fled in the face of the Vietnamese invasion. Note bird on top of corpse. 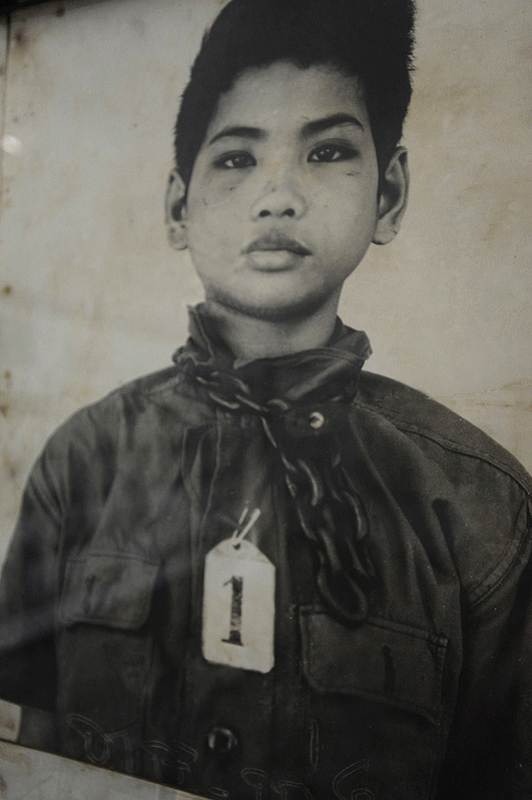 A young boy wearing tag No1. 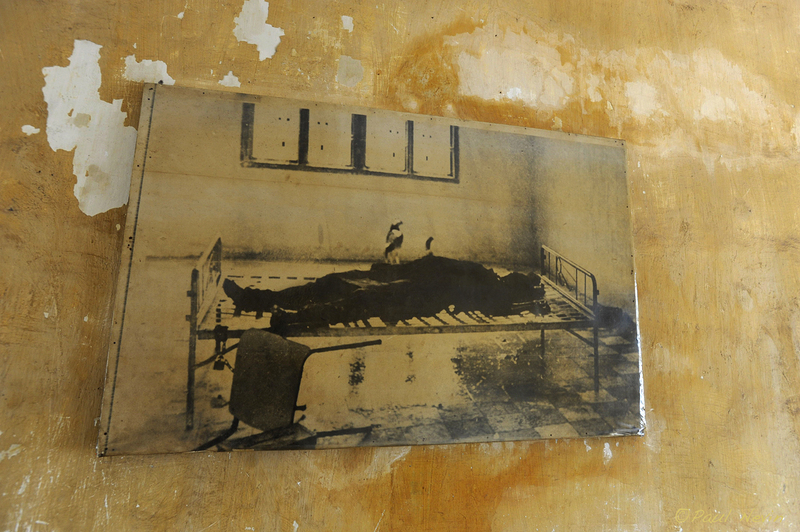 He was the first person to be tortured and murdered at S-21. 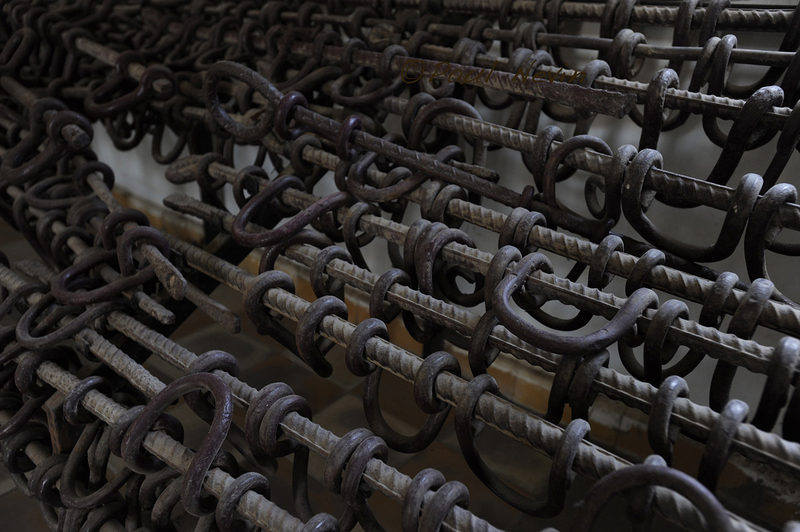 Made from reinforcing iron rod, these shackles and bars were used as harsh rudimentary restraints when torturing victims. Most victims never made it outside unless they were to be hung upside down from the then schoolyard swings which were neatly converted for yet more torture. Every victim was photographed for the record. The first step in their processing before torture, confession and murder. 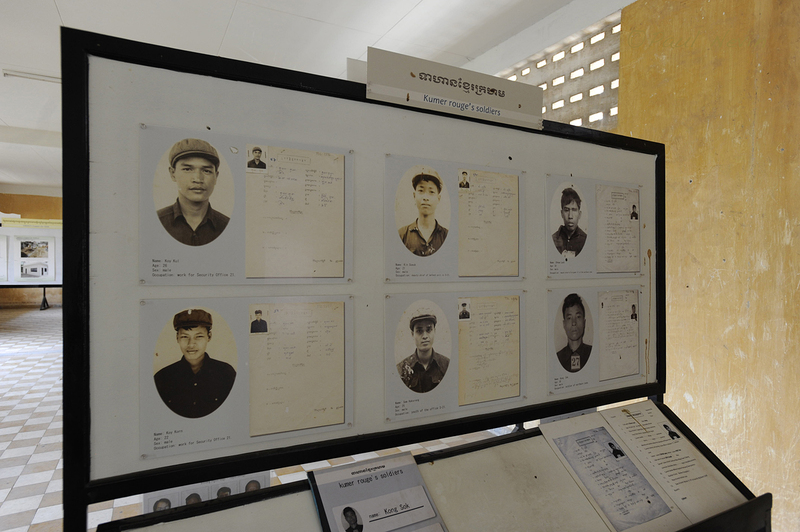 Among the many displays and photographs are these young Khmer Rouge soldiers who worked at S-21. Their job to administer basic but henious forms of torture. 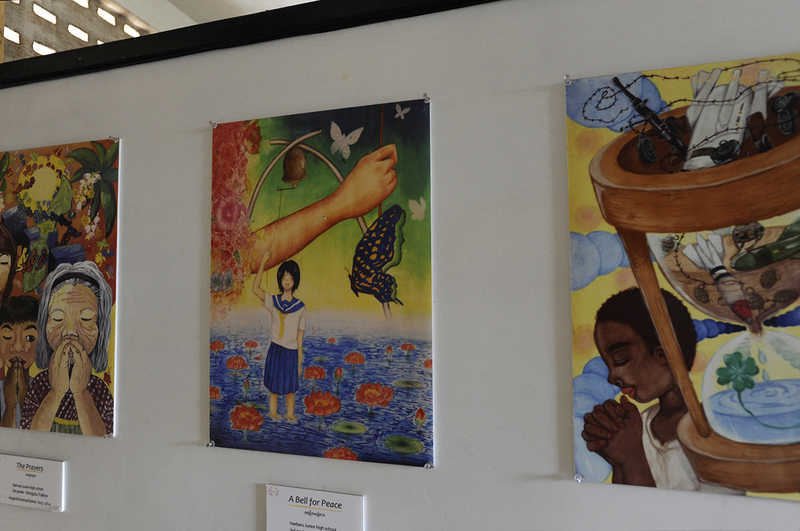 Paintings created post genocide. Cathartic by nature, and for some, one of the many roads to healing. 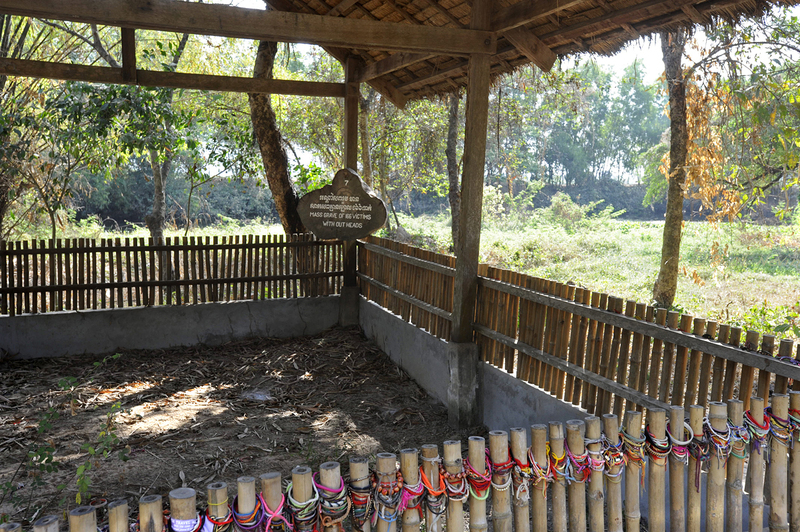 The burial site where the last 14 victims were laid to rest. 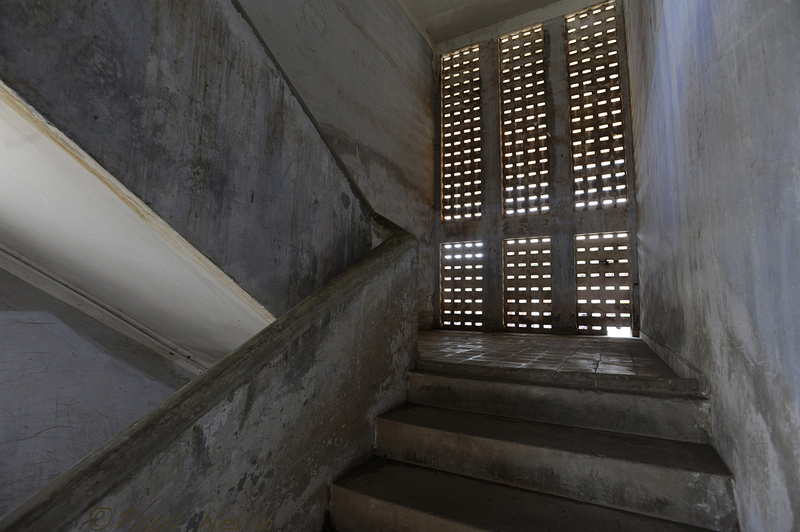 They were found by Vietnamese soldiers when entering S-21 after the Khmer Rouge had hastily tortured and murdered them, then fled. I’d been talking to Paul Raffaele, a writer and friend of mine, about an up and coming trip I was planning to make to Cambodia earlier this year. We’d previously worked on a story together for the Smithsonian Magazine in Northwestern Pakistan. I’d planned to be away a couple of weeks, so a relatively shorter trip than usual. 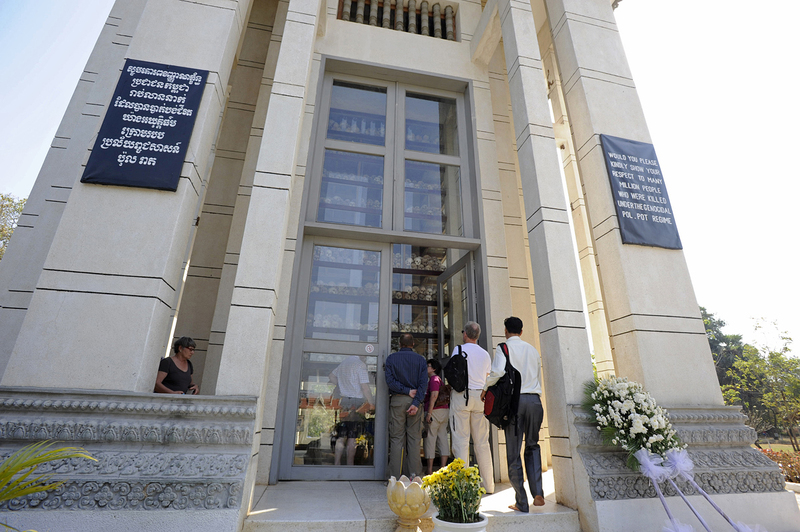 I was aware that it was the ‘dry season’ in Cambodia, and that in Phnom Penh, the former King Sihanouk’s cremation would take place at the end of my stay. With only a couple of destinations scheduled, I wanted to ensure quality time in each. I’ve always wanted to visit Phnom Penh, not only for its place in history, but to experience the capital in the ‘new’ Cambodia. 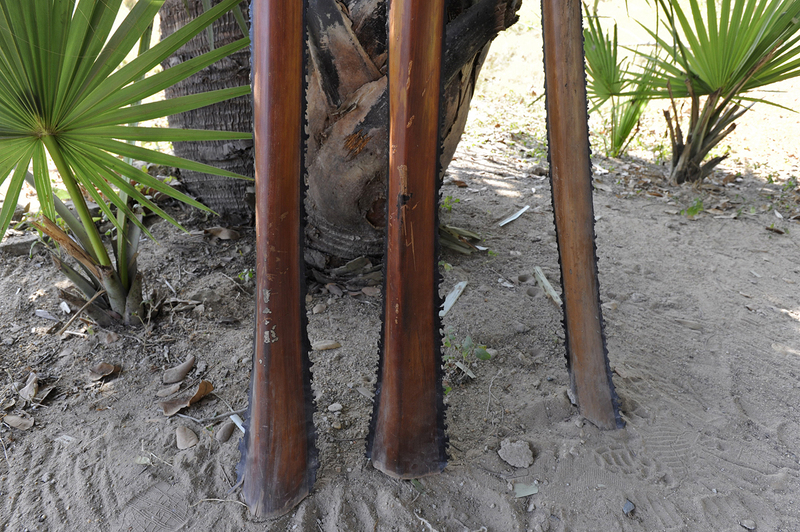 This blog relates to one particular aspect of the trip to Cambodia. 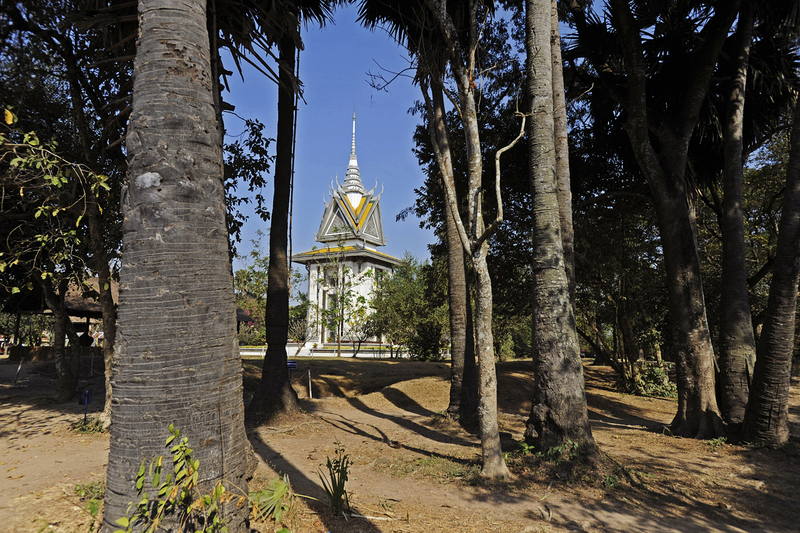 When talking to Paul, he’d enquired about my itinerary, and whether I wanted to see the Killing Fields. My reply was considered and fairly emphatic. I replied that in the limited time available to me, I’d prefer to sidestep that part of Cambodia’s history, primarily because I wanted to explore the iconic places, as I would in any other country. I also wanted to spend some time on and around the Mekong River.